Over the 4th of July holiday, I was chatting with a young friend about her upcoming wedding. Since it's only a few weeks away, she is understandably awash in taking care of details. Despite planning a fairly simple wedding, there is a lot to take care of. 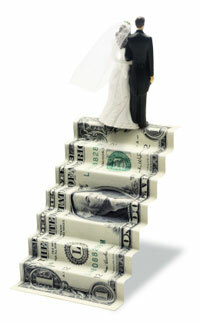 According to any number of "wedding" authorities, you *can* spend $28,000 on the "average" wedding. YOU can. I sure wouldn't. I'm glad I'm not a young bride today. With the advent of bridal reality shows, glitzy and slick magazines and Martha Stewart (yes, I'm blaming her), weddings are now meant to be entertainment affairs that bedazzle and out-do. Guests are to be wowed by the tiniest of details. Posh arrangements are a must, and the bride (after she has been sufficiently "boot-camped" into shape) must make her way down the aisle in the most perfect of gowns, which she has scoured the earth for. Huh. I thought it was about getting married. You know, that lifelong commitment to your spouse. In fact, I told my young friend just that. "Enjoy the wedding plans, but remember, it's about the marriage and not the wedding. We're not going to be joining you on that day to make sure that the bridesmaids' shoes match or what flowers you've chosen as part of your 'theme'. We'll be joining you to act as witnesses before God as you pledge your lives to each other." Weddings already HAVE a theme: it's called love. You can read about it in 1Corinthians 13. It makes for the best weddings, and even better marriages.